With Death’s arrival also comes new slashers, enemies, challenges. 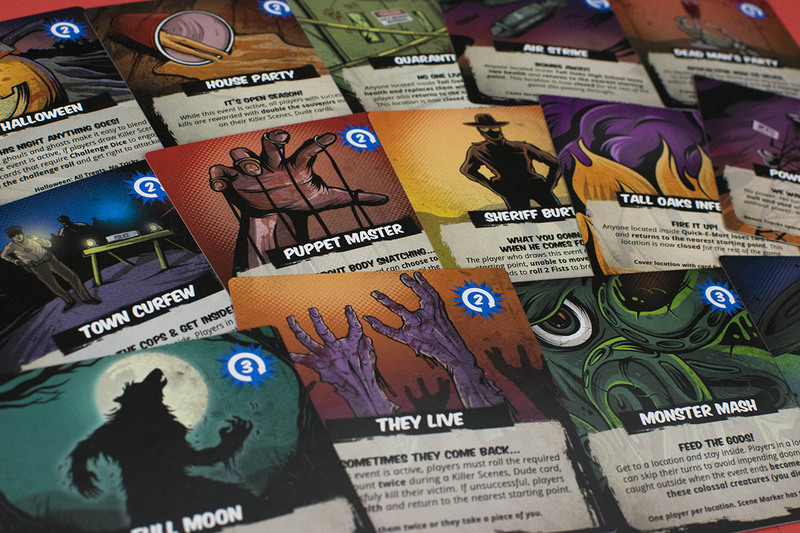 These components and more are packed into the expansion bringing with it more gameplay, and of course, more horror, gore, and wonderful eighties nostalgia to keep you laughing while you’re slashing! Two new slashers join the massacre along with a beastly new monster who can be unlocked by a unique ‘A-Bit of an Event’ card. Draw Challenge cards forcing you to roll the new Challenge Dice vying for a kill, but sometimes activating other troubles. It’s Time For An Event! 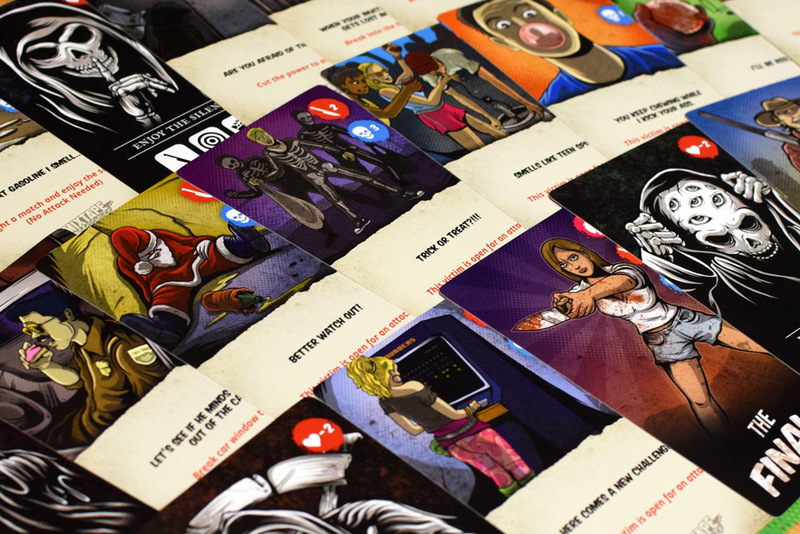 Activate the new ‘A-Bit of an Event’ cards changing the rules, adding side missions, and more for rounds at a time. Brawl with Death in hopes of diffusing Death cards from over taking the board and ending the game with no winner. 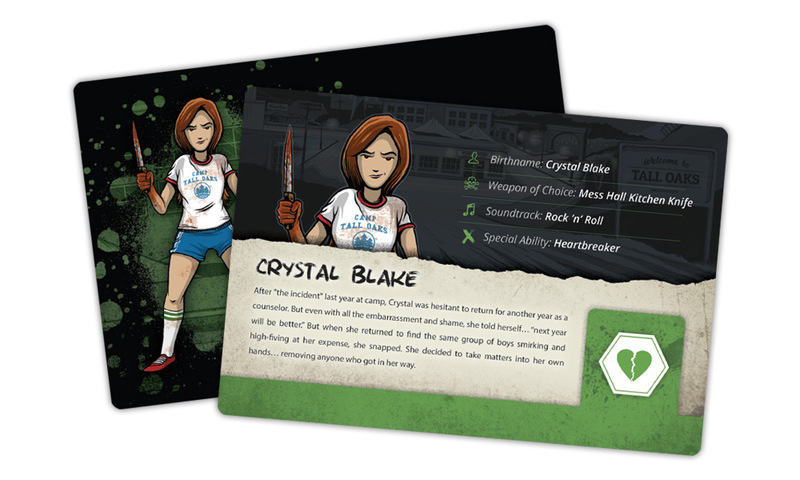 The expansion gives players even more of the fan favorite Killer Scenes, Dude cards, adding more hilarious hijinks and potential victims to the game. 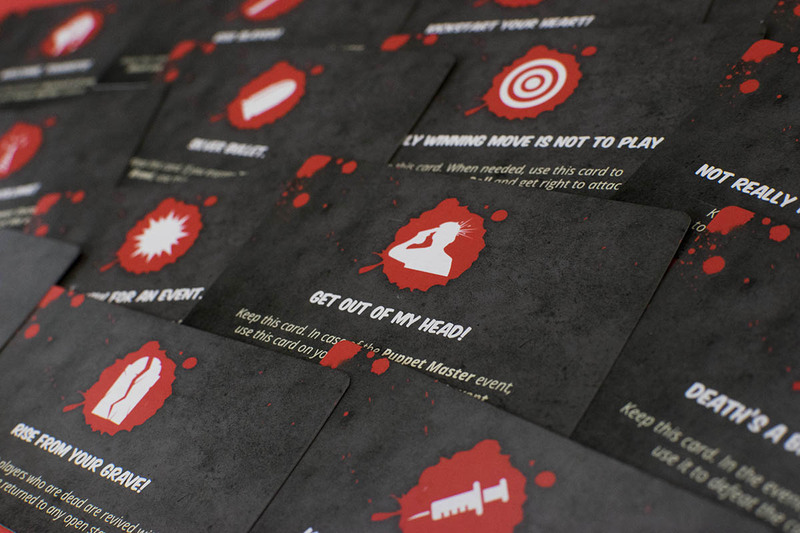 New to the deck are Challenge cards, Death cards, and the Final Girl card adding all new kinds of obstacles when trying to make a kill. 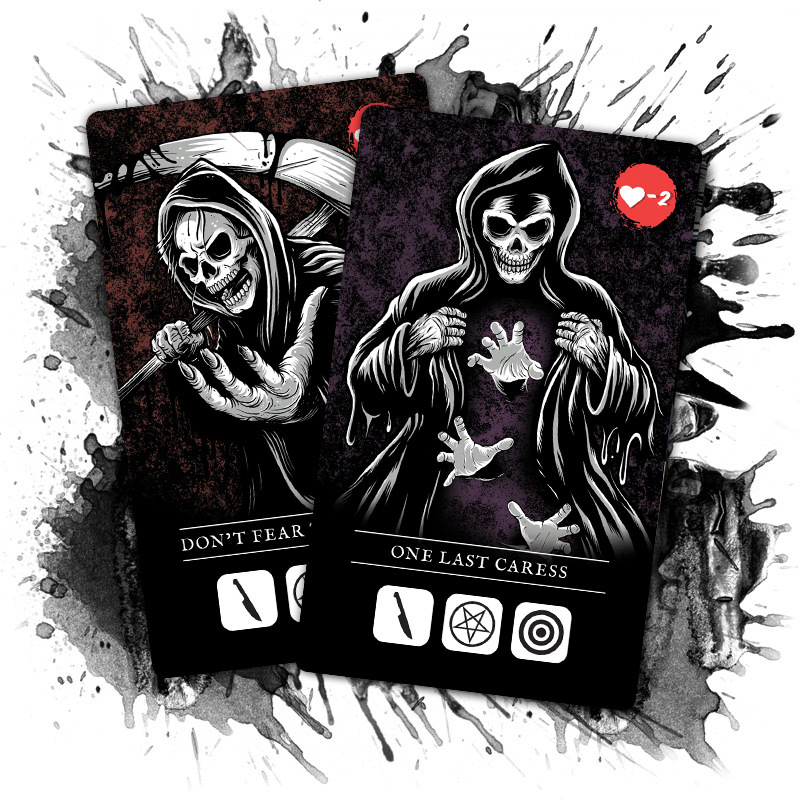 New Mixtapes enter the fray offering possible help or peril as you move around the town, if you’re willing to take the “chance.” Each card can either hurt you or help you. Some you can even keep for when the time is right to use it. 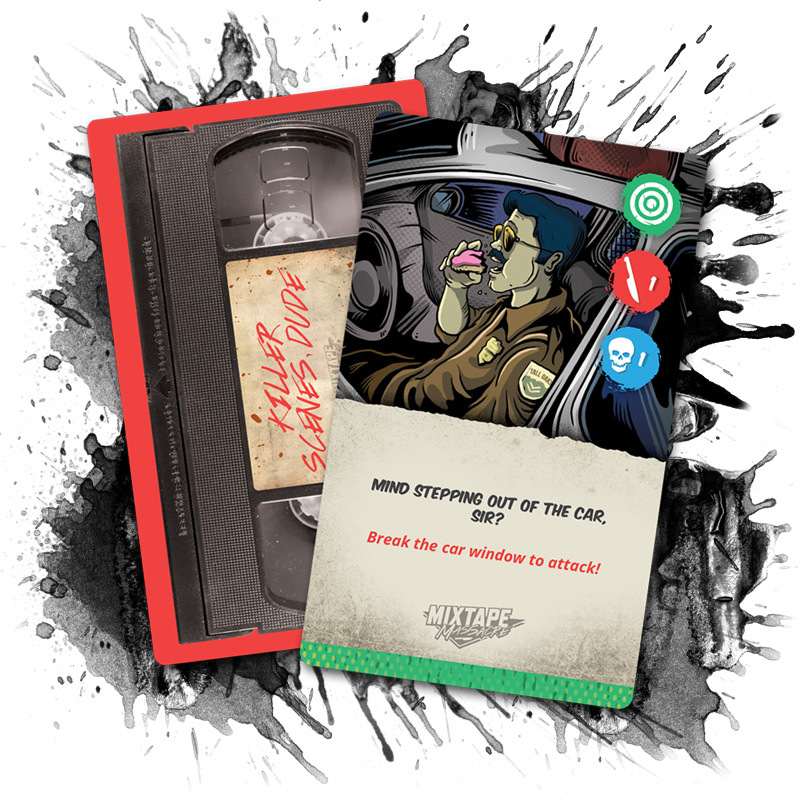 Unlocked through the use of the new Challenge Dice these 15 uniquely illustrated cards can change the rules, add side missions, introduce new enemies, and more for rounds at a time. 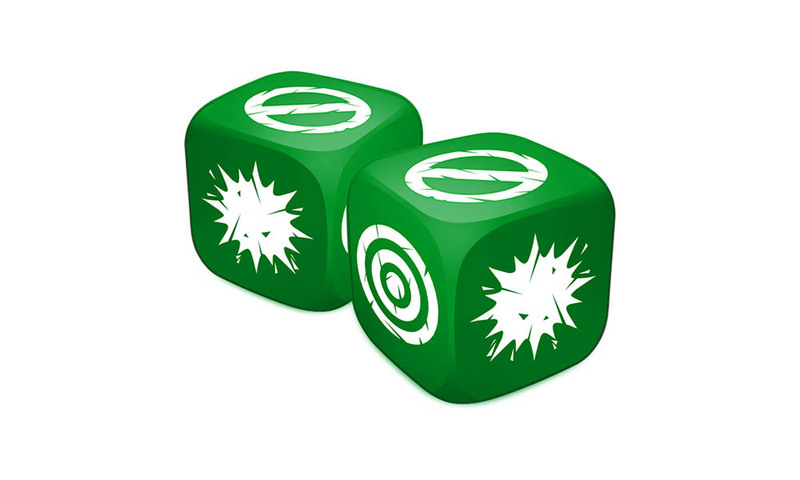 Killer Scenes with a green Engage icon require this dice to be rolled successfully before going in for the attack. If unsuccessful, you run the risk of activating an A-Bit of an Event card. Use this dice to resurrect yourself in the case of death or defend yourself against your opponents in Brawls. 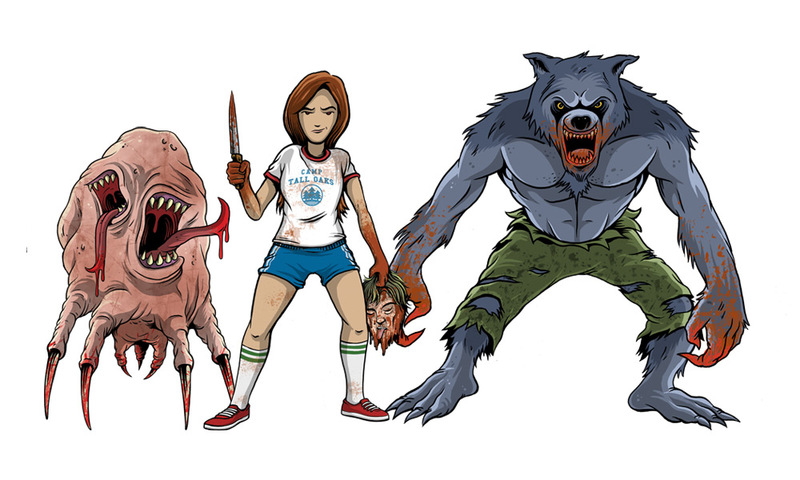 Welcome The Creature and Crystal Blake to your line-up of Tall Oaks slashers. Both characters come with their own unique special ability token that can be used once per game. Don’t forget about The Beast! 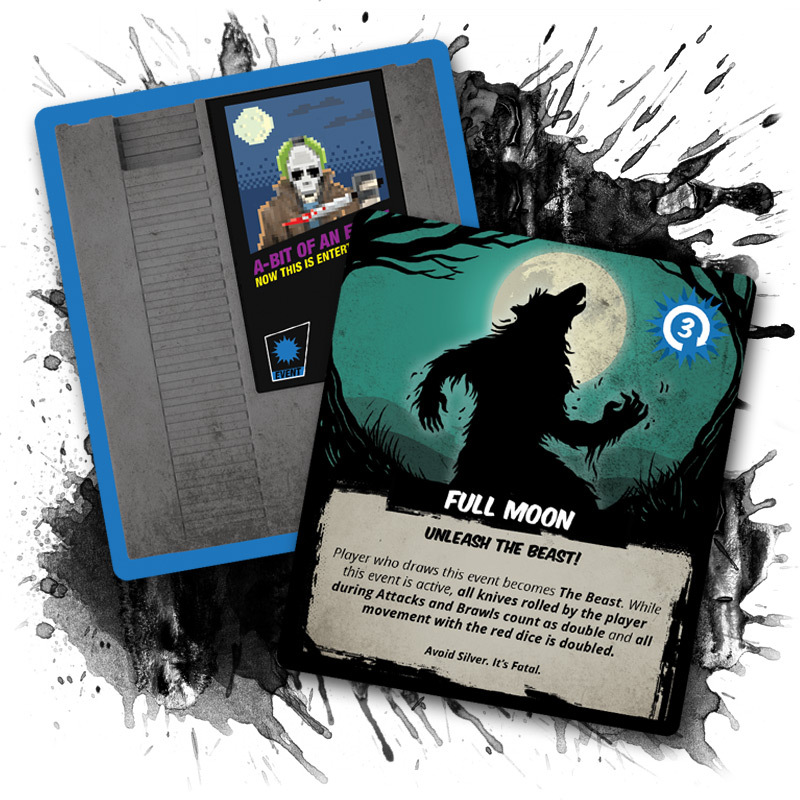 Switch out your slasher to this character when you activate the Full Moon Event with one of the new A-Bit of an Event Cards. Get to know your new favorite slasher! Learn their backstory, their soundtrack of choice, and their special ability. 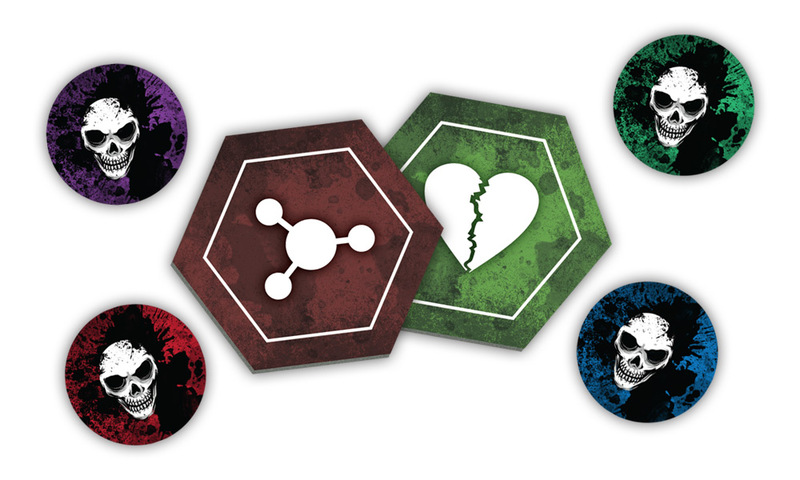 Special ability tokens are unique to their slasher and can be cashed in once during the game. Death Tokens can be placed in the location of which Death has taken over. Once four Death cards / tokens have been activated, the game is over! A Death Peg is a lot like a handicap (almost permanent). 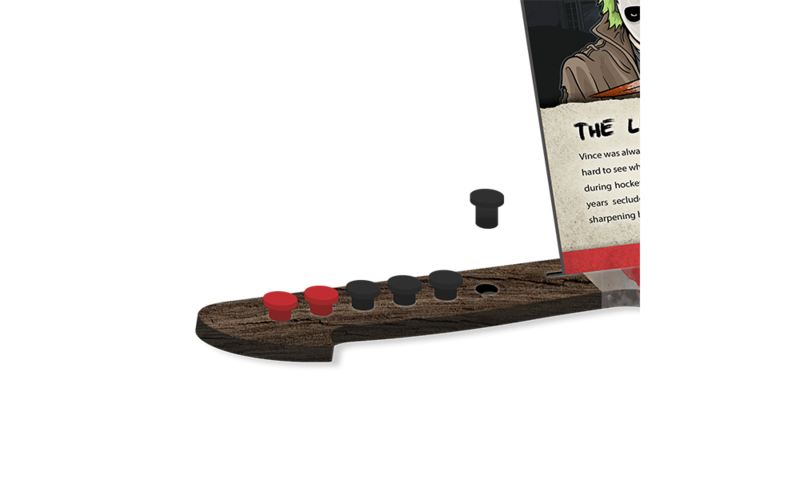 Any spot in your player station filled with a Death peg cannot be refilled with health unless removed with specific Bonus Track cards. Any Death peg healed, becomes a spot that can be revived once more with health. Know the rules and add more to the game. 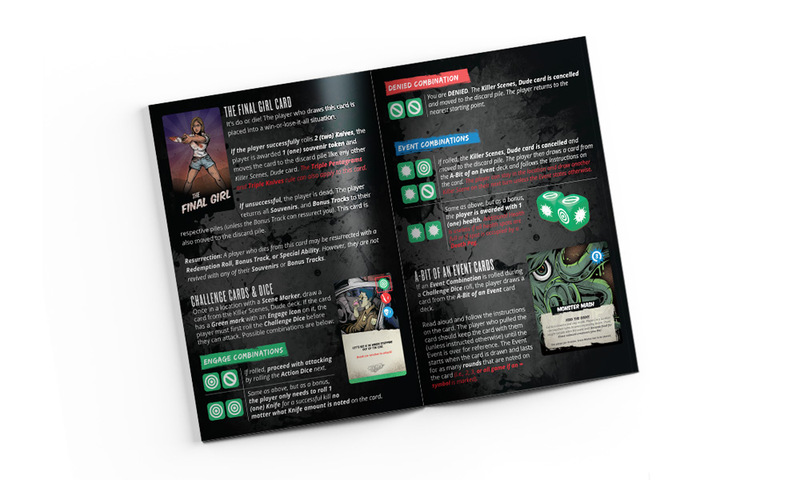 This 12 page, full-color instruction manualhelps you understand the new mechanics added to the game as well as brand new Alternate Rules of Play i.e. using the Challenge Dice during Brawls to defend yourself, or using the Challenge Dice to Resurrect yourself when dead and more. 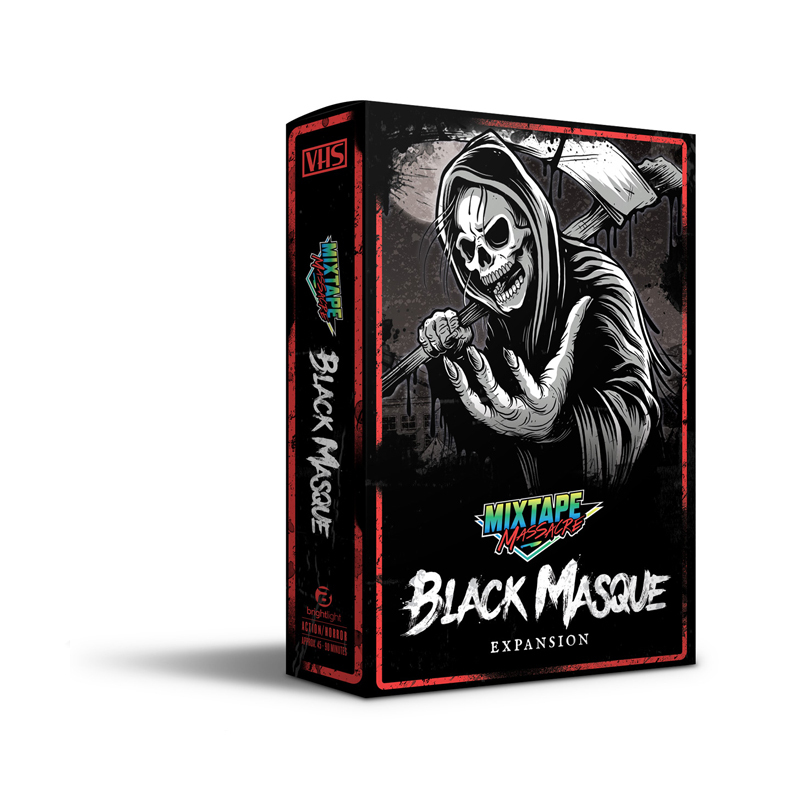 Merrijoy and Freddie (2 of 3 creators) walk you through the components included in Mixtape Massacre’s first expansion, The Black Masque. 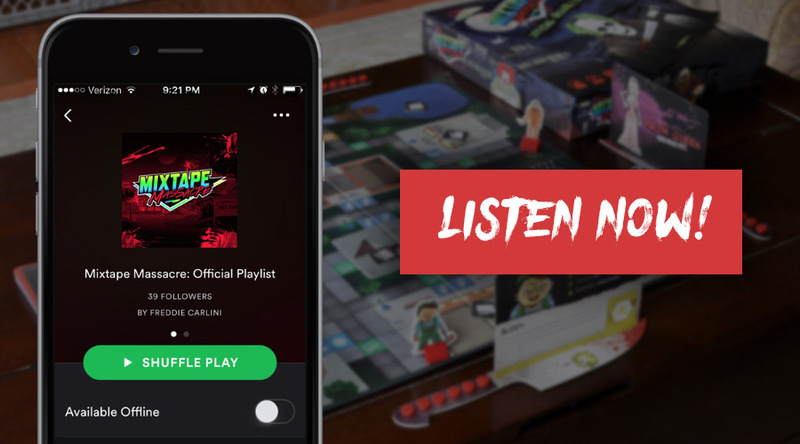 Get your groove on with the Mixtape Massacre Spotify Playlist.